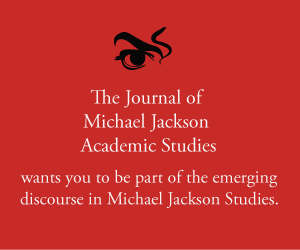 Abstract: In the first episode of 2018, Karin and Elizabeth look back into the year 2017 and how the Journal has evolved, and what she has contributed to the academic landscape of Michael Jackson Studies. Merx, Karin, Elizabeth Amisu. 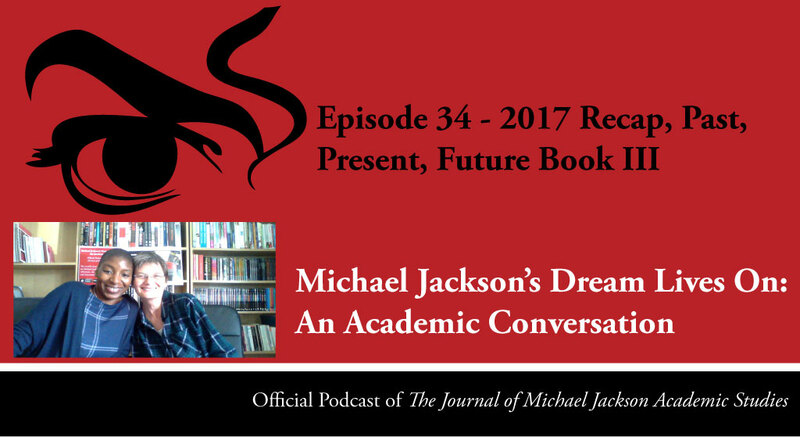 “Episode 34 – 2017 Recap, Past, Present, Future Book III ” Michael Jackson’s Dream Lives On: An Academic Conversation 5, no. 2 (2018). Published electronically 21/01/18. http://michaeljacksonstudies.org/episode-34/. 1. Elizabeth Amisu, Dedicated Page with all Contributions. 2. David Nordahl, ‘An Interview with David Nordahl‘ The Journal of Michael Jackson Academic Studies vol. 5, issue 1 (2017). 3. Daniel Bropks, ‘An Interview with Daniel Brooks‘, The Journal of Michael Jackson Academic Studies vol. 5, issue 1 (2017). 4. Ivana Recmanova, ‘Information Entropy in the Billie Jean and Beat It Vocal Notations’, The Journal of Michael Jackson Academic Studies vol. 5, issue 1 (2017). 5. Joseph Vogel, Earth Song: Michael Jackson and the Art of Compassion (CreateSpace Independent Publishing Platform; 3 edition, 10 Sept. 2017). 6. Elizabeth Amisu, “Earth Song: Michael Jackson and the Art of Compassion’ by Dr. Joseph Vogel’, The Journal od Michael Jackson Academic Studies vol.5, issue 1 (2017). Thank you so much for the ‘honourable mentions’ – I mean that most sincerely and really appreciate it. This was a very stimulating conversation which should spark even more ideas for articles and discussions. I’m a fan, first and foremost, but I’m a writing fan who is interested in MJ academia, so I’m not in agreement with everything said in the podcast, but that doesn’t matter. As you both state, the important thing is that we encourage each other to keep on researching and writing about Michael and his art and influences etc, and continue to have discussions. I really don’t think Michael is passing from living memory… the fan activities more than anything, along with the professional tributes (like the Lip Sync Live special that took place this past weekend in LA) means that Michael Jackson isn’t going to disappear any more than Elvis Presley did once he died. The great thing is, through the academic discussion, we can express our ideas on these things and present supporting evidence or propose theories to support our case. That’s what I find exciting. I’m sorry that Elizabeth has stepped down, as her contribution has been been so throught-provoking, but I’m sure Karin will continue to maintain the quality and integrity of the Journal.